Spicy, aromatic and rich in taste and texture, phad tai and tom yang goong are definitely one of the most ubiquitous Thai dishes served in Thai restaurants in Korea. 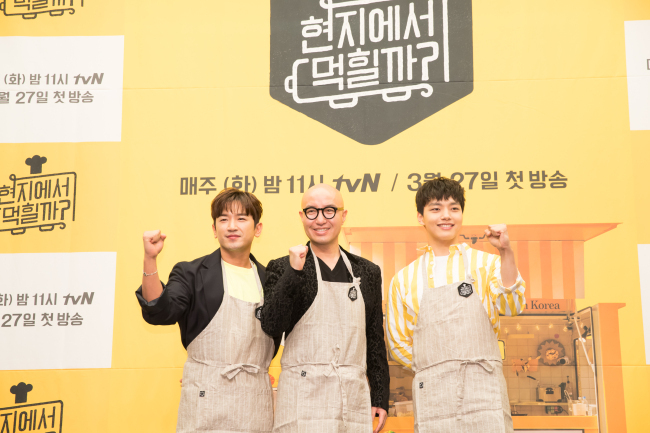 Riding on the ongoing trend of cooking reality shows, tvN’s new show will feature how a trio of TV celebrity and restaurateur Hong Suk-chun, actor Yeo Jin-gu and Lee Min-woo of K-pop boy band Shinhwa, transform into food truck entrepreneurs and sell Thai dishes on the streets of Thailand. The show is also a twist of “Youn’s Kitchen,” a popular tvN variety show where most recently celebrities ran a pop-up Korean restaurant in Tenerife, Spain. Hong and Yeo will take the role of a chef and an assistant chef, respectively, while Yeo will be tasked with driving and other chores. Hong, a Korean entertainer who became a successful restaurateur running several restaurants in Itaewon, Seoul, including My Thai, said taking on the food truck business in Thailand was one of the most meaningful things in his life. “I’ve been working in the food service industry for 15 years, and when I first heard of the idea of the show, as a businessman, I immediately started calculating gains and losses. I was also scared of the idea that if I make some mistakes in the show, it would directly impact my restaurant business in Itaewon,” said Hong during a press conference for the program held in Seoul on Monday. Program director Lee Woo-hyung, who also attended the event, said that he chose Hong has he has insight into food. Lee was cast based on his longtime friendship with Hong, he added. Yeo, who makes the first ever appearance as a regular member in a variety show, said he decided to star in the show as he thought the experience would be valuable. “I enjoy visiting famous restaurants. But while filming the show, I got to serve customers, which was very new to me. And I decided to say ‘I enjoyed your food’ whenever I go to restaurants,” he said. Lee Min-woo said that he has been enjoying cooking since middle school and has gained more interest in food since living alone. All three of men are famous celebrities in Korea, but inside the food trucks, they are just vendors stripped off of glitz and fame. And director Lee said that he hadn’t expected the trio to be so committed to their new work. “Now they joke and laugh about their time in Thailand. Actually, the three fully, seriously threw themselves into this food truck challenge, sleeping only four hours a day,” Lee said. “Will This Do Well Locally?” is set to air at 11 p.m. on Tuesday.